The competition, funded by the american recovery and reinvestment act, is open to school districts and nonprofit partners working with official announcement a district or consortium of schools. 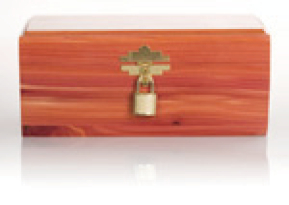 Our Redwood urns come in 4 sizes and can be ordered in a natural state or have a lacquered finish. Their simple design makes them an attractive yet subtle presence in any home or office. 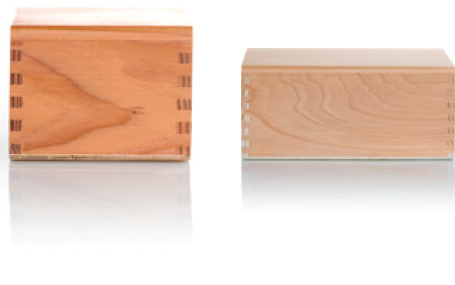 These urns are made of aromatic cedar which has a pleasant aroma. They are designed to have a knotty rustic look and are finished with brass hardwarde and a high gloss lacquer. We suggest ordering a velvet bag which holds the remains within this style urn, so if opened the velvet bag will make a nice presentation. Our Alder urns come in 5 sizes, though custom sizes are available. They are hinged in the back and can be locked using the lock that we provide. We suggest ordering a velvet bag which holds the remains within this style urn, so if opened the velvet bag will make a nice presentation. Our Maple urns come in three sizes. 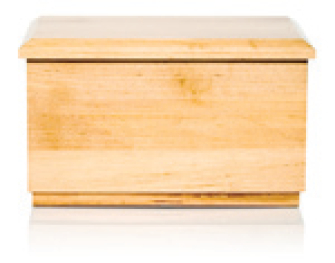 This new elegant design offers a slightly different look than other box style urns. 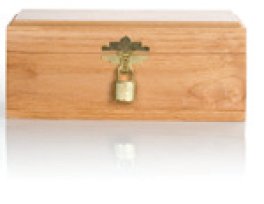 Our Cedar urns come in three sizes. This new elegant design offers a slightly different look than other box style urns. 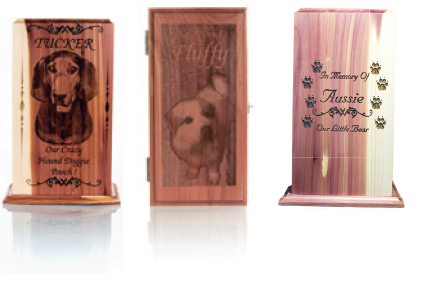 Personalized laser engraved urns are available on alder, cedar and redwood. Either standard cut out photo laser engraved on a cedar tower run or reversed photo laser engraved on a cedar urn. Full gold, black, or silver face plates can be created to fit horizontal on the lid of the wood urns or vertical on the front of the tower urns. We can even add a custom photo to the gold or silver face plates. Color photos are also an option on these paltes. 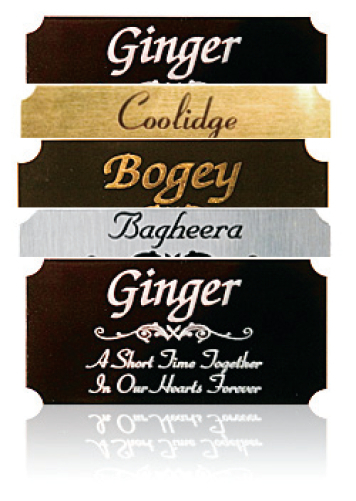 Small brass plates can be personalized for attachment to most of our urns. Available in 3x1, 3x1.5, and 4x2 inch sizes. PetReflections metal urns offer Old World beauty and elegance in two beautiful and durable finishes. We offer finished antique bronze and pewter. Personalized engraving on these beautiful pieces is also available. 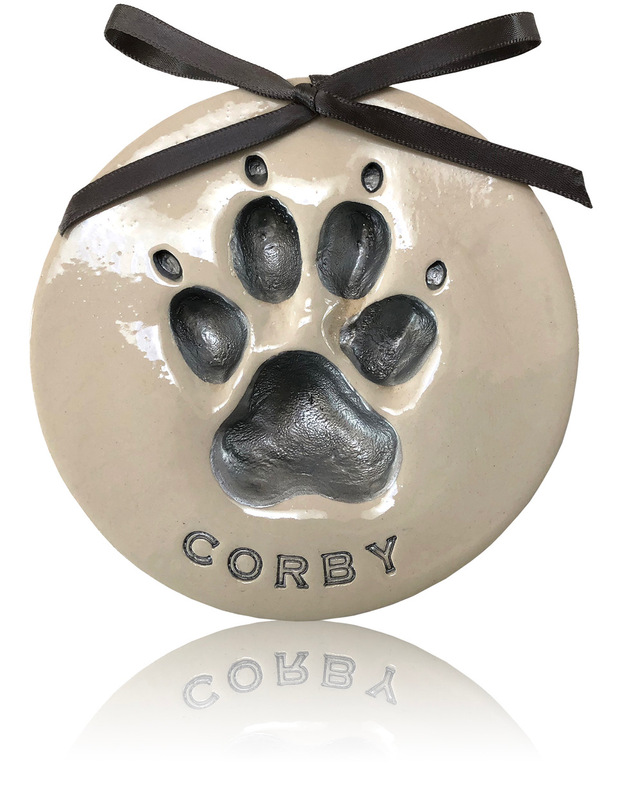 Our Paw Prints are a permanent remembrance of your cherished pet and the impressions they made in your hearts. 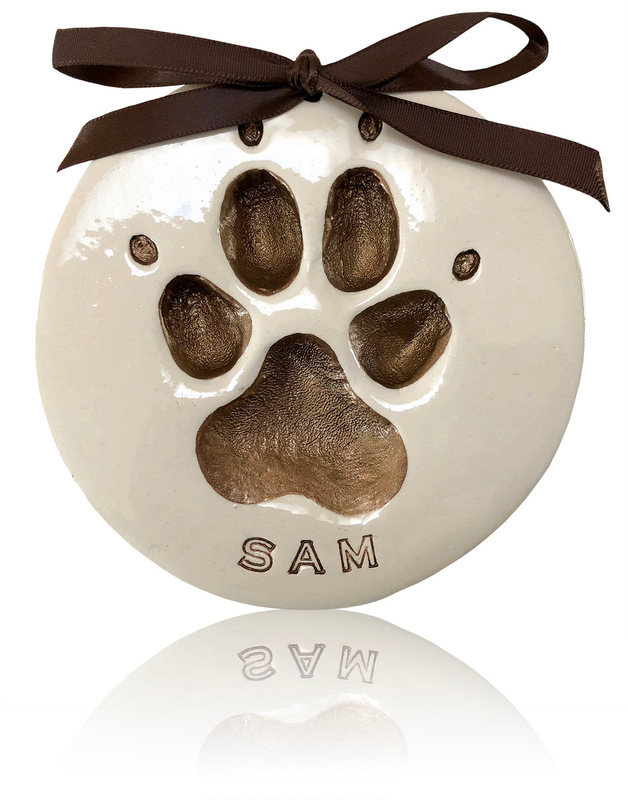 PetReflection Paw Prints are hand crafted and hand painted with care and tenderness from start to finish. 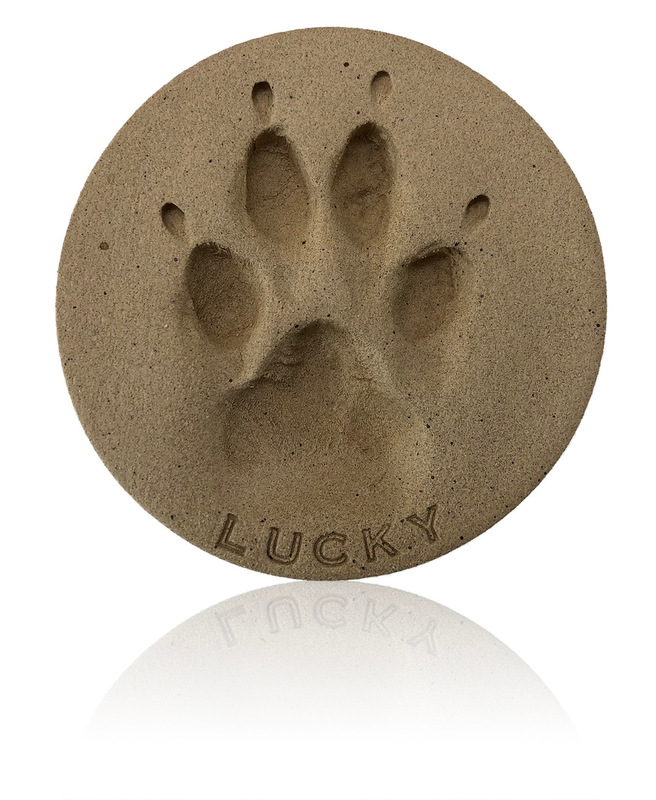 Each Paw Print is made from your pet’s paw impression which is what makes them so unique. Available for Dogs, Cats, Birds, Reptiles and Exotic Pets. Paw Prints are available with private or group cremations. 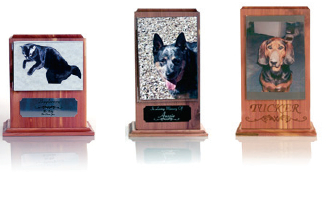 PetReflections offers only the finest hand crafted natural made memorial urns. Each unique urn is carved from a solid piece of marble and polished to a high gloss finish. 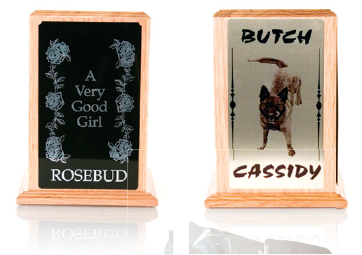 Laser engraving can be added to really personalize these urns. Patterns and colors vary with each urn. 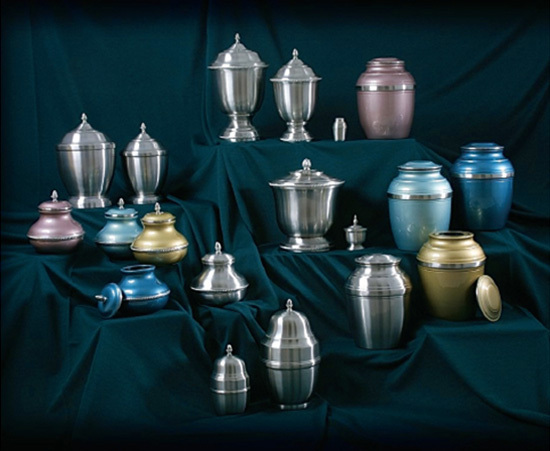 These urns are available in the colors indicated: Rosemary, Seashell, Grey, Black Orchid and Green Onyx. PetReflections offers over 300 varieties of dog, cat, bird & reptile figurines. Please contact us to help you choose the one that fits your needs. 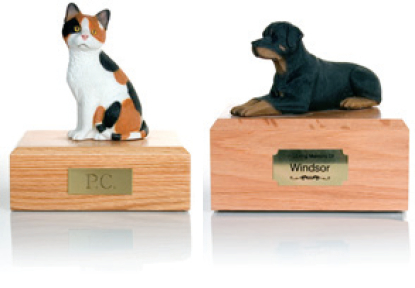 These pet figurines may be ordered and placed on our wooden, ceramic or marble box style urns.